Today's look is both casual and fun - great for running errands on a Saturday. It was inspired by a favorite style blog of mine. 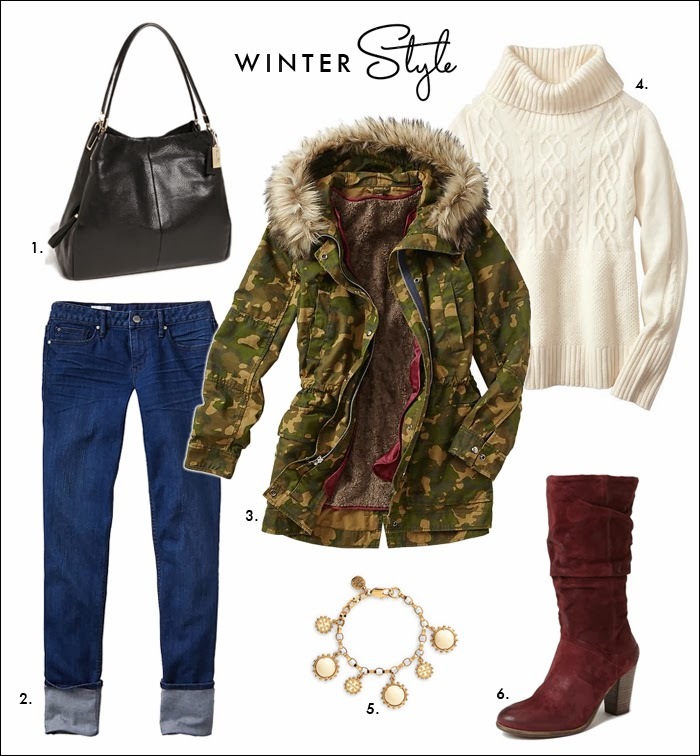 This camo parka is a lot of fun (and right on trend with faux fur and camo print). It looks extra warm with the sherpa lining - which is removable so when it is warmer, the lining could be removed for a thinner spring/fall jacket. And, the camo parka is on sale (and if you can believe it - it is only $35! - on sale). I love these burgundy slouchy boots. I have been looking for a red pair of boots, and I like the slouchy style. I think they are more flattering because they balance the width of my hips when I am wearing skinny jeans. I love short booties, too, but sometimes, I think slouchy boots are the better choice, plus in this extremely cold weather, they keep me a little warmer around the ankles. Hope you are having a good week so far - and staying warm!